A bowl of popcorn is always a fun snack. 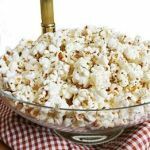 This Italian seasoned popcorn dish is a great addition to your appetizer spread. It has a hint of lemon along with Italian herbs. Make a bowl and surprise your guests. They will be sure to ask how you made it and you don't have to tell them it only took 15 minutes. In a medium sized covered pot, add the oil and popcorn. Cover and place on a medium heat. Lift the pot and shake pan frequently while pan is heating. When the popping slows to less than a pop per second, remove from the heat and set aside. Using a grater or a micro-plane, grate the lemon peel (lemon zest) from two medium sized lemons. Place in a food processor. Add the salt, oregano, basil, cheese, garlic and melted butter to the food processor. Mix until blended, about 10 seconds. Pour over the popcorn and mix until popcorn is evenly covered. 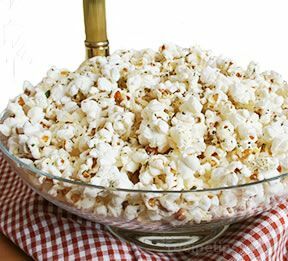 Transfer popcorn to a bowl and serve warm or room temperature. If leftover, store in an airtight container for up to 3 days. This entry was posted in Appetizers, Healthy Sides and Snacks by Linda Carman. Bookmark the permalink.